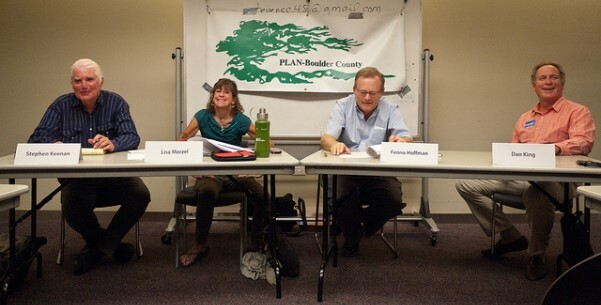 The final PLAN-Boulder County City Council candidate forum on September 23, 2011 featured Stephen Keenan, incumbent Lisa Morzel, Fenno Hoffman, and Dan King discussing affordable housing, city financing, and whether the current council is violating property rights. Moderator John Tayer again started off the program asking for a 90-second introduction from each candidate. Stephen Keenan talked about roaming the state last year, and then living recently in Estes Park. But he said he’s spent half his life living and working on Pearl Street. He’s eager to get educated on ballot issues 2B/2C. Lisa Morzel talked of her 12 years on council, saying she’s worked to make a compact, diverse community. 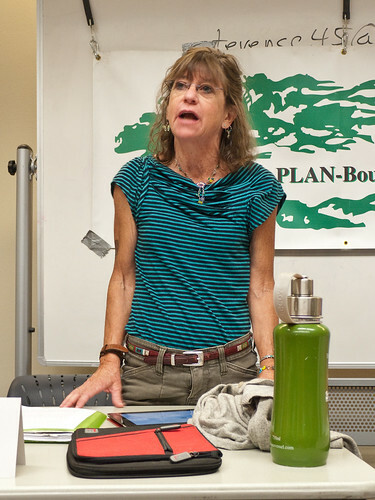 She’s helped build the city’s financial reserves, worked on the Climate Action Plan, zero-waste initiatives, the open space management plan, and policies to strengthen the city’s economy. She says she has a comprehensive understanding of the issues, and she wants to forge ahead with action on energy, sustainable land use, and support of local business and the arts. She says as a geologist, she can take the heat. 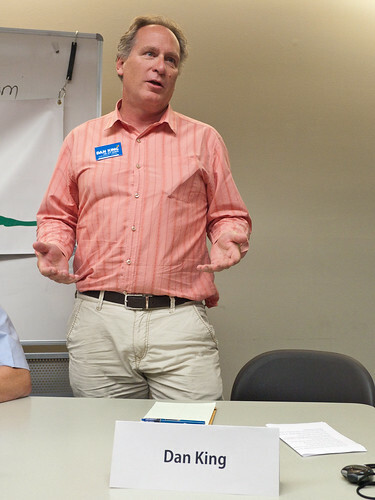 Fenno Hoffman wants to get more people involved in forums like this one, to get engaged in issues and then to vote. He says he wants to be an inclusive voice, not an ideologue. He wants to make government more responsible, support the local economy and green business, make walkable neighborhoods, and plan for peak oil and climate change. Dan King is the co-owner of the Outlook Hotel. He talked of his esteem for his mother, who worked in a school cafeteria to support the family after his father died when King was four. As a council member, he would focus on the budget, not just for the immediate term but to ensure fiscal health over the next five to 10 years. 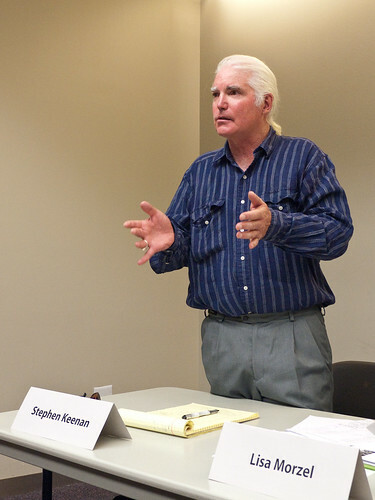 He served on the Blue Ribbon Commission, and emphasized new ways to close the city’s funding gap and new ways to talk about the budget. John Tayer then asked some questions of the candidates. What is the major issue facing the city, and how would you address it? King: The biggest issue is the funding gap, which blends with every other issue. We don’t have the financial resources we used to have. We need to find different approaches, different ways to provide services. Boulder can be a leader not just in energy, but also in funding for government. Hoffman: The biggest issue facing the city is the same issue facing the US: how climate change will require us to adopt more affordable lifestyles and specifically more affordable housing. We need to make more compact neighborhoods to encourage walking, and make our labor source more local and more competitive. We can share our approach with the greater world and be a model. Morzel: We need to define our long-term vision, especially regarding energy, and keep a strong financial position so that we can afford to be independent in energy. Coal is not the future, and continuing our current relationship with Xcel is not a good idea, as it commits us to a coal-based system for the next 50 years. [Ballot Issues] 2B/2C don’t take us directly to municipalization, but they will allow us to answer questions about the costs through FERC (Federal Energy Regulatory Commission) and local court rulings. Without them, we have no leverage with Xcel. We need to find a 21st-century solution to our energy needs. Keenan: I grew up in northern New Jersey, so I’m comfortable studying the stock market. We’re losing our middle class, and middle-class people are no longer coming to Boulder. For the needy, we’re giving out fish, but we’re not teaching people how to fish. I used to be able to walk into any restaurant and get a job, but no longer. We’re losing social mobility. Housing has gotten less affordable, and we need to allow higher buildings in order to provide more affordable housing. Speaking of affordable housing, what’s your take? King: We have an affordable housing problem because Boulder is a great place to be. We’ve created a great community, and that creates demand. So we need to chip away at the problem, continuing our current programs. We need to look at transportation accessibility of affordable housing, and add density in some areas. Hoffman: I work with people all over the world, and the best minds in the business can’t solve the affordable housing problem. The real crunch is in middle-class housing, which has different issues, including the current suburban configuration of most of our neighborhoods. We need to better optimize our housing supply for the people who live there, to replace our current one-size-fits-all housing model. Morzel: Originally I couldn’t afford a house in Boulder, so I built my own house with sweat equity, and it’s extremely efficient. We should look at the whole cost picture including energy costs. On council, I helped bring about the inclusionary housing ordinance. But we need to look at other solutions also: ADUs, OAUs, and group housing. We’re missing the middle class. CU could help, by buying houses on the Hill that are mis-managed and making them faculty or staff housing. How can we solve our regional transportation problems? Morzel: People working in the community should be able to live in the community, in functional housing. At San Juan del Centro, we had to work to make sure people had good access, even just across the surrounding streets. It’s important to keep affordable housing residents from being isolated, and we should spread the housing throughout the community. Keenan: I helped bring the first mattresses to the homeless shelter at the old bus station at 9th and Pearl. We’re providing the material needs of the homeless but not succeeding in giving them self-esteem. The downtown and library are being affected a lot. On transportation, I’m a walker and a biker. I don’t like FasTracks; it’s a slow train to Georgia. Hoffman: We talk about transportation as its own issue, but it’s completely connected to land use. Transportation and planning are even different departments in the city, so there’s this mismatch. Our whole region is suburban, which makes it hard to serve with transit. People have to be able to walk to the stations. Currently there isn’t the zoning along the rail corridor to justify train service, and rail can cannibalize bus and other transit. We have to make sure to focus on service, not what particular vehicle it would use. Morzel: Land use and transportation are definitely tied together. In particular, our open space program has helped to keep the city compact. We should also think about other ways to get around, like jitney services or organized hitchhiking. B-Cycle is good, but we need to get more people using it including visitors. Should the city work to move people out of cars, and if so how? King: Absolutely. The fossil fuel age is coming to an end. We need a change to society, finding simpler ways to live. We’ll continue to struggle with it for the next 20 years. The great thing about Boulder is we take it seriously. 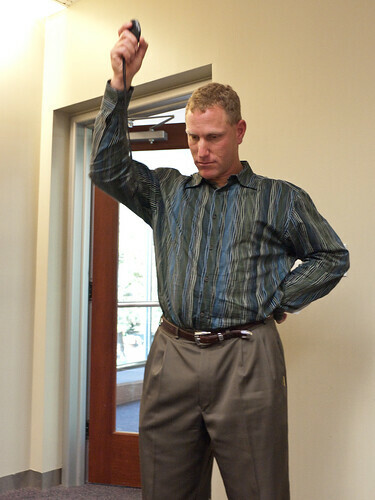 Hoffman: Everyone should stand up, look down, and see your feet! But we can’t expect people to walk from Table Mesa to Gunbarrel, say. So we need to start designing the city so it makes more sense to walk than to drive. Morzel: I worked on the new pedestrian crossings with Tom Eldridge. We need to focus on the local: bike and pedestrian safety, access to buses, local grocery stores, small neighborhood retail. Would you support regulations restricting plastic bag use in stores, or requiring a charge for them? Hoffman: I wouldn’t support regulations, but we should encourage a charge for bags. The nickel charge on aluminum cans really helped reduce litter. It’s great to have all the young people engaged in this issue – they’re more engaged than the parents who drive them to the City Council meetings. We should remember, too, that there’s lots of plastic on the stuff inside the bags, so bags aren’t the only problem. This issue also takes time from some of the larger problems. Again, we’re trending in the right direction without regulations. King: We’ve been on a zero-waste journey at our business since 2004. Eco-Cycle asked us to go with them to council to encourage action on the plastic bags, and we did it happily. I think the stores will welcome it, because not giving out bags cuts store costs. Keenan: I’m going to digress here. I have a friend whose ill father stayed at Dan’s hotel for almost nothing when he was ill. Dan’s a great guy. He also knows complex financial instruments. Morzel: I produce less than five bags of trash per year – actually now I’m down to two. Everybody can do this. I favor a fee on bags: it’s getting the polluter to pay. We should also reduce Styrofoam in the waste stream. Remember, plastic is virgin oil. What’s your stand on Ballot Issues 2B/2C? Keenan: This is why I’m running. We could stay with Xcel month-to-month indefinitely, but if these pass it will force Xcel to come to the table to negotiate. But I don’t want to buy old poles and wires, because of the news coming out regarding magnetism and gravity. We should condemn the Valmont plant. Hoffman: I’m still conflicted. I’ve looked at the city data, but I still have questions so I can’t commit. I’m worried about Boulder becoming energy isolationists, like the isolationists during World War II. Maybe it’s better to participate in the broader discussion? We should remember that our impact is tiny relative to all the coal plants China is building. King: I support the ballot items. The city has done a good job of getting the issue to this point. Remember, it’s a process, so we don’t yet know the answer. And municipalization is not a solution in and of itself. We have to focus on our broader goals, and create a model for others to follow. Do you support a commercial energy conservation ordinance, like SmartRegs but for commercial buildings? Morzel: Staying on the municipalization issue for a moment, I agree the city has done a great job. And the citizens’ group has shown that we can achieve a 66% CO2 emissions reduction at rate parity. Now, to the question: SmartRegs has had outstanding success. Landlords are updating their buildings and reducing their CO2 emissions. We can do the same in the commercial realm. We should work with the business community – it’s a different situation than residential buildings. We’ve done well at reducing solid waste in the residential area, but not so well in commercial. But it’s in businesses’ interest because it will save them money. Following up on that, can you also talk about how to address solid waste? Hoffman: Businesses are pretty happy with the recycling program we have. We focus on the energy usage of a building, but let’s look at the bigger picture: why is that building that way to begin with? For example, the separation of housing and commercial buildings doesn’t always make sense. We should look at the bigger picture, especially mixed use. King: Our hotel has been zero-waste for a long time, because I want to but also because it’s good for the bottom line, both in terms of the costs and the public profile. I’m concerned about regulations, but SmartRegs were a place where regulations made sense. The city put its money where its mouth is with incentives to landlords. But commercial is indeed different, and the regulations need to be different. We need to convince business owners that conservation is the best thing for their businesses. Keenan: In my work I’ve gotten to know all the big commercial landlords. But I’m seeing favoritism in recent developments, especially with the Daily Camera site. The city attorney and city manager have lied about this. The landlords don’t trust the city staff, the city bureaucracy. We need more outreach to the big commercial landlords. We should be able to get the landlords on board. What’s the best use for the Planning Reserve? King: You mean, besides a Walmart? Just kidding! We should set it aside for something of great community value. If Naropa needed it, that would be worthy of consideration. But a big health club, no. Morzel: It’s called a reserve for a reason. There’s lots of available land already in Area I, like all the parking lots, and there’s Area II land. Area III is for future generations. For Naropa, we need more creative thinking. For instance, in North Boulder we could assemble small pieces like the Armory and underdeveloped properties on Broadway. What student wants to be way up in Area III? There would also be a transportation problem. We need a library in North Boulder, so a partnership with Naropa on that could work well. Hoffman: Naropa is the only viable use I see right now. We should do what we have to do to keep Naropa in the city. If we trust council to set our electric rates, then we should trust council with the planning reserve, so I’m okay with changing to a two-body approval process. If we’re not going to open the Planning Reserve in order to keep the town compact, we may need to be more flexible with our zoning. King: On the issue of a library in north Boulder, when I think library I think of a stack of books, but it’s much more: access to computers, a community center, an after-school learning center. We need to change the messaging, talk about it as a resource for an under-served population. Morzel: The planned north Boulder library is where it is because it’s next to the city’s largest mobile-home park. It’s very useful for non-English speakers and the economically disadvantaged. It helps bridge the digital divide. Keenan: The main library is one of the finest buildings downtown. In the ‘80s there was a proposal to move the main library out to 55th St, and we can thank John Spitzer for saying no to that. This building is more than a library – the homeless use it a lot. I don’t know where Area III is. I need to learn about zoning. There followed a few questions from the audience. A lot of the residences in new developments downtown are “luxury” condos. Why don’t we build more, smaller units? Hoffman: I would support that. But it makes more sense in some of the neighborhoods surrounding downtown, which we’re currently downzoning. Morzel: I worked with Tom Eldridge to get residential downtown, but it’s disappointing because it’s not affordable. The average size is about 1600 square feet. My four-person family lived in 400 square feet. We should look at making smaller, less expensive units. Fenno Hoffman said we should optimize the size of housing, increasing density. Where should density go? King: It makes sense on transit corridors, but we have to be sure we’re not creating ghettos. But I’m not a planner, so I won’t pretend to be one. Keenan: I do support dense development. We have a vibrant Section 8 program, but the city subsidies are huge. And what about housing for working people? We need to allow buildings to go higher. PLAN–Boulder County had great imagination in 1955 with the blue line and open space, but now they’re opposed to increased building height. There are places it would make sense, like the Transit Village. I lived in Copenhagen; they know how to design things, and they have plenty of high buildings. What’s the relationship between land use and peak oil? Morzel: How big a town do we want to be? Density increases population, requires more city services, and that costs money. We’re about done with adding density. Denser housing should be balanced by density relief, for growing local food, for example. I used to grow 30% of my own food. How many people moving to Boulder want to live in dense housing? And we don’t want to take out mobile home parks or other entry-level housing. Do we need more density? Hoffman: You have to keep in mind the effective population of Boulder is really 170,000 when you consider in-commuters. We’re fooling ourselves when we say 100,000. Our impact spreads all over the region. On the Blue Line’s Community Questionnaire, I said the ideal population for Boulder was 25,000, because that’s the number our water supply will be able to support with climate change. Density is not a one-size-fits-all solution; we need single-family dwellings also. But living in a dense area can be very desirable. King: I agree with Fenno. Keenan: I believe in Orchard Grove and the other mobile home parks. I’d like to see the population stay at 100,000, but the climate here brings people in. We can’t shut the gate. What is your stand on ballot item 2A, the $49 million bond issue? Hoffman: I support it, but we need to do long-term revenue management. Our system of dedicated funding is a problem. We should pay better attention to the recommendations of the Blue Ribbon Commission. King: I was on the Blue Ribbon Commission, and we recommended doing what 2A does, so I support it. The money will come from the retirement of existing long-term bonds. People ask if this is evidence of deferred maintenance. We do have deferred maintenance, but that’s due to the recession, the way you might put off buying a new car when your income goes down. But deferred maintenance is starting to catch up with us. I also support priority-based budgeting. Morzel: I also support 2A. But we need to tread lightly on dedicated funding: people vote for open space, parks, libraries because they want them. For general funds, we should pass a general fund tax. Let’s not lose our dedicated taxes – people won’t go for it, for one thing, and they also lead to better discipline. Has the current council been violating property rights? Keenan: I like the current council. It’s not corrupt. But medical marijuana is a new thing, bringing in revenue. It really has a use as medicine, but we’re leaving the MMJ industry high and dry. We rushed it. We also should support establishment of a state bank for the MMJ industry. Morzel: No, council hasn’t violated property rights. We have to make sure what one person does doesn’t infringe on others. I supported the compatible development rules. It’s about mutual respect, like respect for the environment or a lifestyle. The city has been balanced in listening to both sides of the issues. Hoffman: In the development world, you hear talk about infringement of property rights. Remember, when the Boulderado was built it blocked the view of the Flatirons, and beloved buildings at CU block views, so we need to be careful. It’s a balancing act. 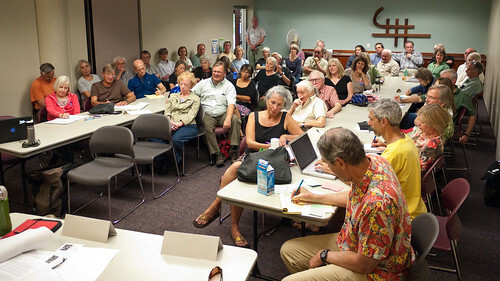 What’s your vision for Boulder in 30 years, and how will you have helped make it so? King: It will still be a wonderful place, with its great environment and access to it. There will be a changed culture of consumerism. We’ll define success as other than the amount of stuff we have, or the kind of car we have. We’ll be forced to make this change. Keenan: City attorney Tom Carr was hired to address the problems on the Hill, but he has room for improvement. Morzel: Boulder will be compact, sustainable, inclusive. I grew up in Kansas City and when I came to Boulder, I couldn’t believe how little diversity it had; we need more people of color. 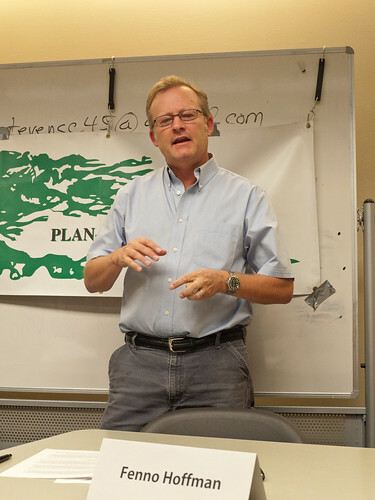 Boulder will be financially secure and independent. It will still be leading in sustainability and helping to create a better world. Hoffman: In 30 years, I’ll be in my mid-80s. I hope I’m not in a retirement community in Lafayette, spending my day on a bus to go shopping. I hope I’m in my own apartment where the grandchildren can walk over to visit, and I can walk with them to go get some ice cream. They’ll get ice cream, and I’ll get bourbon.